the arrival of Mrs. Maryam Rajavi was welcomed warmly by the participants in the grand gathering. Mrs. Maryam Rajavi commended participants and mentioned the struggle will continue to free Iran. She commends to the citizen of Khoramshahr for their resistance of which are being deprived of drinking water. Mrs. Maryam Rajavi mentioned I am here to announce your desire. The victory is at reach and Iran will be free and the victory is invincible. At this moment she is being connected to the Mojahedin in Albania via satellite and some pictures aired inspired the participants in the gathering. She congratulated establishing of Ashraf 3 to the Mojahedin onward to set up 1000 Ashrafs inside Iran. Mrs. Maryam Rajavi pointed out the extensive struggle comprising the different segment of Iranian society like Teachers, laborers, farmers and retired and plundered. All of these are an indication of the Iranian’s longings for freedom. Due to the deep internal crisis of the regime, the rift at the top of regime leadership, restoring sanctions, the US withdraw from the nuclear deal, vanishing, and the might of regime warmongering all indicate the regime’s era has reached to its end. The most important parameter is the joining of furious of deprived people with the organized resistance which guarantees overthrow of the regime. After the brutal attack of Iraqi Criminals on behest of the Mullahs’ regime in 2013 and closing the camp, Mujahedin announced that they will set up 1000 Ashraf inside Iran. Therefore, the strategy of joining the vanguard resistance organization with the risen people inside Iran emerged. After that, the issue of resistance network inside Iran, revolutionary councils and organized Iranian resistance, were on the spearhead of the struggle for freedom in Iran. This is the duty of all Iranian inside and outside to support this strategy. June 30, 2018, the annual Iranian convention has just begun. The program started with one artistic action with participants had traditional clothing and Iran’s flag representing the solidarity. This program will be aired worldwide and also inside Iran. This program echoes Iranian protestor’s outcry to the world. Near hundred thousand have taken part in this annual gathering. She stated that One of the signs of the ending phase of the regime is fabricating fake alternatives. The genuine alternative must have the history of struggle with mullahs’ over the past 37 years of the regime. The overthrow of this regime requires a force with experience of struggle for freedom against the tyrannical religious regime. She also pointed to the fact that myth of reform from the inside of regime has come to an end. 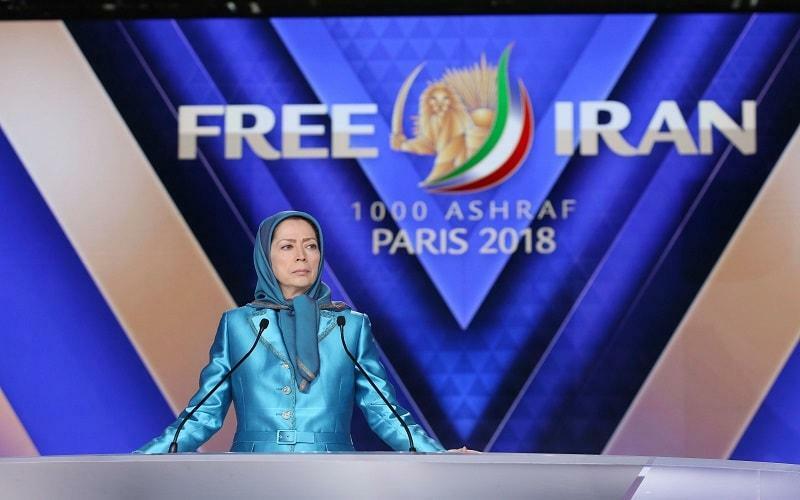 Mrs. Maryam Rajavi reiterated that this was the NCRI paved the path for taking part all the republican freedom lovers in the struggle for democracy in Iran by announcing the National Solidarity Front.